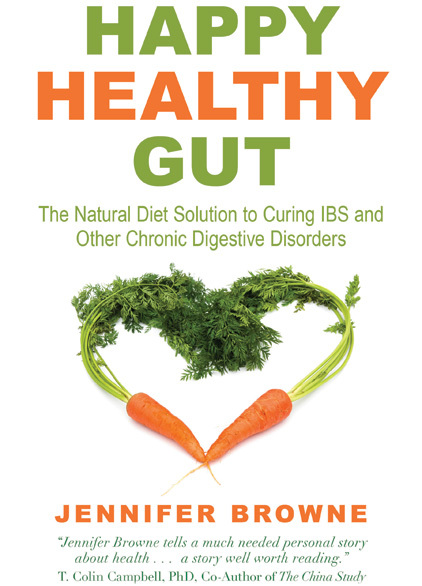 One of our favorite friends and customers is Jennifer Browne, who recently authored Happy Healthy Gut: The Natural Diet Solution to Curing IBS and Other Chronic Digestive Disorders. It's a book about Jennifer's painful but triumphant journey from constant digestive illness to her present state of vibrant health. In a nutshell, Jennifer's book reveals the essence of her "miracle cure" --- going to a plant-based diet. Jennifer Browne's plant-based plan for curing her digestive system. The phrase "plant-based" is one Jennifer prefers over "vegan" or "vegetarian" but regardless of what it's called, she doesn't eat much in the way of animal products. And it's working out well for her. Not only is her IBS (diagnosed) a thing of the past, but she's done it drug-free --- by simply changing what she eats. She describes the transition as relatively simple, once she decided to take the plunge. Before Jennifer changed her diet, she had terrible discomfort from bloating, constipation, and general tummy pain. Plus she was hooked on laxatives. She eventually discovered that much of her pain was wheat-related, but she also found she was sensitive to meat. She points out in her book that, while people have intolerance to gluten, nuts or lactose, few people are aware that they might be meat intolerant. Jennifer didn't realize what meat was doing to her until she eliminated it from her diet. Now that she's healthy and pain-free, Jennifer is telling the world how she did it. In large part, it involved going to a meat-free diet --- but it also included eliminating processed foods. Jennifer has become an advocate for less meat and more veggies. So how come Jennifer buys meat from our farm? Jennifer's family still consumes some animal products, and as a result she tries to buy the healthiest and most nutritious ones she can find, which has brought her to our farm and to our products. We take that as a wonderful compliment to how we do things. For those of us who eat meat, Jennifer has penned a thoughtful and informative article on the benefits of grass-based meat products over grain-based. She's done a good job of the article. And for those of you who know someone who is suffering from IBS or any other chronic digestive illness, consider giving them Jennifer's fine book.